Maize Valley Winery in Hartsville is introducing a new event for 2010, the Vintner's Dinner series. These monthly dinners on the third Thursday of every month will feature delicious, locally grown foods prepared in the kitchens of Maize Valley. Each course will be accompanied by a wine flight pairing (2-3 ounces) of a Maize Valley Wine that has been carefully selected to compliment and enhance the food with which it is paired. Maize Valley Winery located in Hartville invites you to join them on Thursday, January 21, for their first monthly Vintner's Dinner. 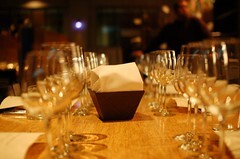 The complete menu for this 5 course meal is available at http://www.maizevalleywinery.com/vintnersdinnermenu.htm. Winemaker Todd Vaughan will be on hand to explain a little more about the winemaking process, as well as why and how he chose the wines to go with the evenings meal. The cost for this first dinner will be $35 per person including tax and gratuity. Advance payment is required with your reservation and can be made by calling 330-877-8344. This event will be limited to 40 guests. This is your opportunity to learn a little more about the winemaking process, to taste and explore new wines and learn how they complement and enhance the foods they are paired with, and a chance to make new friends.